In 2002-2003 Mars ran a prominent campaign under the strapline of 'pleasure you can't measure.' A range of tactical placements saw strip ads placed against relevant editorial across magazines and national press. This example is a sponsorship that was negotiated with 442 / FourFourTwo magazine. Every month page 3 had a photo that captured 'That FourFourTwo Moment' from the month before. 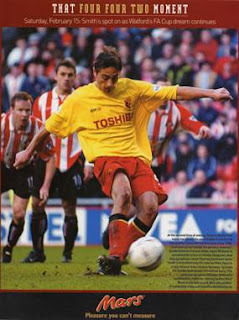 Mars took out a long term sponsorship on this page and featured Tommy Smith in their April issue, 2003. Great work!